UDM Downloads > Word Repair Free! 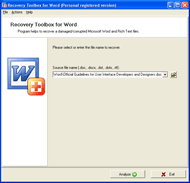 Word Repair Free is a very simple to use program which is extremely powerful as a Word document recovery solution. You should be backing up your work, however even if you do (and many of us don't) you can still lose valuable documents because of software error, hardware failure or even because of virus and malware infections. No matter how you lose a Word document, the key issue is how do you recover it? Downloading Word Repair Free is your very first step - it takes seconds to download from our site and install it on your PC. From there you only have to follow a simple, 3-step process to recover and repair your damaged or corrupted files. Word Repair Free will perform a deep scan and analyze errors on a variety of Word file formats, including .doc, .dot, .docx and .dotx and will also recover .rtf files (Rich Text Format). It doesn't matter what storage media is used either - Word Repair Free will recover them. While there is a powerful error tracking and identification algorithm powering Word Repair Free, the user interface is extremely simple and follows a 1-2-3 process. Step 1 is where you select the file to be scanned and repaired. Step 2 is where Word Repair Free undertakes a deep file scan and identifies the issues. Step 3 is where the results are returned to you for review and you confirm file recovery is to be performed. That's all there is to it - as simple as 1-2-3 and so easy a child can do it. When you need to recover your Word documents, accept no substitutes - download Word Repair Free today!